Now you can add light virtually anywhere and provide years of efficient, maintenance-free lighting for off- electrical grid applications. 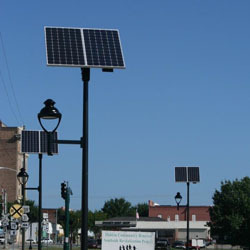 Our standard GridFree combines an LED with Solar Street Lights USA’s artful yet strong structural elements in Solar Street Lights USA’s engineered solar electric power system. GridFree is also available with an LED light fixture on a custom basis. GridFree is a Made-in-America product specially designed to meet the demanding performance and lighting needs of roadway engineers, parking lot designers, the military, landscape architects, and outdoor lighting professionals. Turn-key – Complete system, mounts on our 5″x5″ or 6″x6″ square galvanized steel pole or can be adapted to mount on wood, fiberglass, concrete or other steel poles. Designed for fixture mounting heights from 18 feet to 34 feet. Cobra Head style fixtures with Type II to Type IV distribution; lumen output ranges from 3350 to 11,000 lumens; standard CRT is 5000K and the CRI is 80 plus. Lamp wattages are 40 Watts to100 Watts with dimming available. Choice of Full Cutoff (Dark Sky Compliant) or Semi-Cutoff fixtures. Brilliant Sun™ (Patent No. D610.536), architectural mount withstands 170mph gusts. Locking NEMA 3R battery and electronics enclosure made with heavy aluminum and stainless steel hardware; includes neoprene gasket around the door and a neoprene pad to insulate the battery from the enclosure floor. Mounts at the top or bottom of the pole. Long life, deep cycle sealed batteries. Temperature compensating battery charger and light controller. Colorization of the pole, enclosure, fixture arm, PV module mount, and fixture in any PMS color.